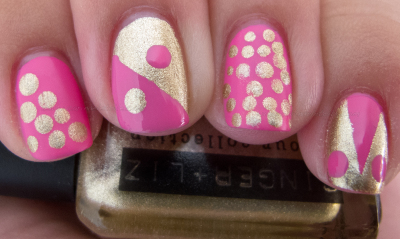 Nail art has never been my forte. 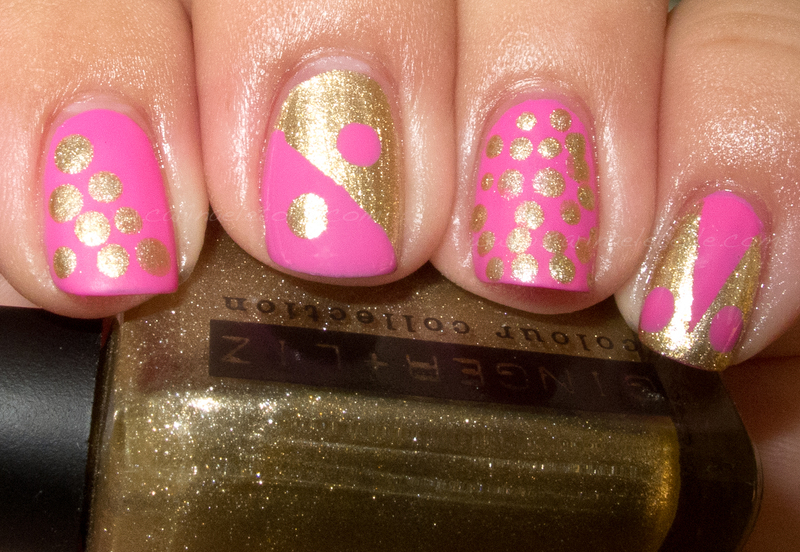 I decided to bust out with the dotting tools and my tape…Don’t laugh too hard. I swear, I’ll get it right one day. For now, please know I’m a n00b at this. The colors I used were Ginger and Liz’s Got My Groove Back and The-brand-that-shall-not-be-mentioned’s If You Moust You Moust. I wanted to do something fun for me, but not in the Ruffian Mani with a French Mani accent kind of way that I do things. I took some tape and made the V you see on my pinkie nail. I also taped off my middle finger in the section. I also busted out with the dotting tool. Truth be told, I’ve always been a bit scared of doing nail art and, most importantly, the dotting tool. Dotting tools are a little frustrating to me. I can’t seem to master using them. I know that they’re fun and I love seeing what people have done with them, but for some reason I just can’t ever really get it to work. Everything always looks like a fail. 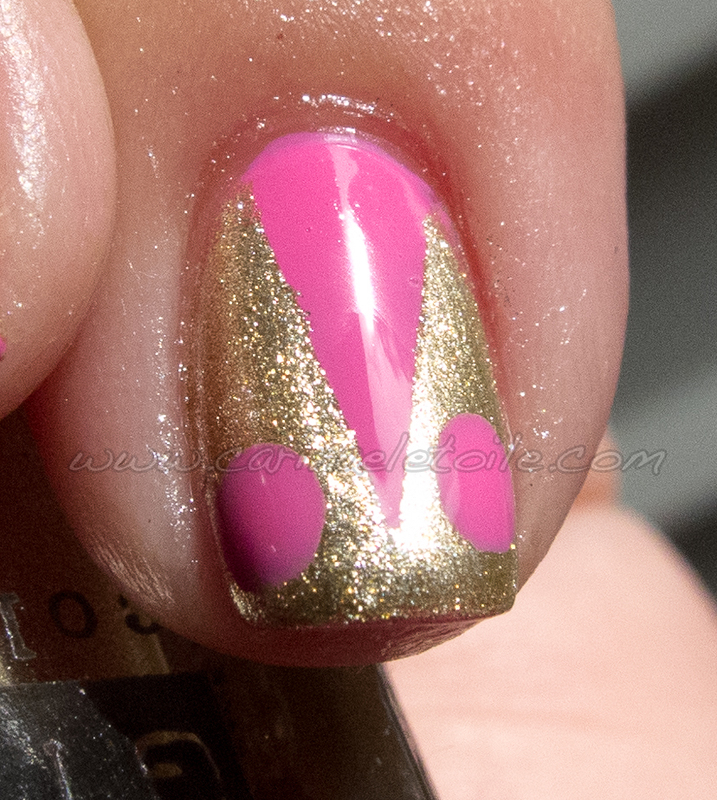 At least to me…and then to make matters worse, I thought I’d try to make this pink and gold mani all cute by using a matte top coat on my pointer and ring finger. You can’t even tell it has the top coat on. It looks sort of…shiny. Le sigh. Oh well, at least I tried and I ventured out with nail art…It’s something I rarely ever do. I may have to try it some more. 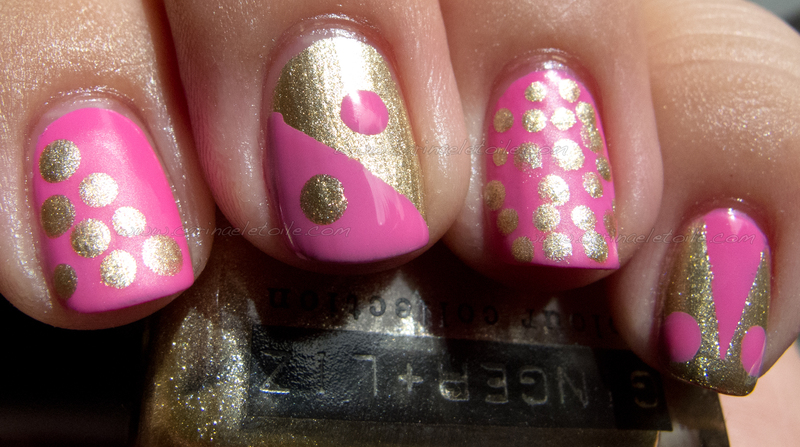 So here is my offering of a mani for Pediatric and Breast Cancer awareness. As always, please right click the image to see it in its original size. If you liked what you read, please click Like at the bottom of the page.